Yesterday, I was talking to one of my online clients, and our discussion turned into a very in-depth conversation that I thought was really profound, and could be useful to a lot of you. Chris happens to be getting really incredible results—down 12 pounds of fat and up 4 pounds of muscle in 7 weeks total—and not only are these the best results he’s ever gotten…this 7-week period is pretty much the ONLY time he’s seen consistent progress. Even though he’s been training for years, if you were to graph out Chris’ results over the course of that time, it would mostly be a flat line, interspersed with a series of “blips” that were few and far between. However, during the time he and I have been working together, he’s made progress, week after week. Why the change? Is it because I have some magic up my sleeve? No—contrary to popular believe, I did not attend Hogwarts, I do not ride a broom, and I cannot do magic of any kind. That trick, simply, is to avoid the mistakes that most people make. If you can manage to avoid some of the more common mistakes, I guarantee you’ll see your progress skyrocket. And one of the biggest mistakes, by far is a phenomenon known as program hopping—which is when clients move from program to program to program, often without even finishing them. Even when they DO finish a program, these hoppers don’t really think about the overall structure of their training as a whole, and move to whichever program seems cool at the moment. As you can probably guess from the tone of my assessment, I don’t think highly of this; in fact I consider it to be the number one mistake that is holding people back in their training. Now, let me just say that I completely understand the desire here: you want muscle, so you do a muscle building program; then you want fat loss, so you do a fat loss program. From a logical perspective, that does make a great deal of sense and things SHOULD go well. Regrettably, logic and physiology don’t always play nicely together. Here’s the problem: when you jump from program to program, these training methods often vary from each to a very significant degree. Of course, on occasion, that works out well, and the “change” in stimulus can lead to increased metabolic disturbance and force an adaptation—which means can lose fat, gain muscle, or both. Unfortunately for us all, most of the time, though, that’s not the case. You see, your body is a tricky organism, and while variety definitely has its place, it’s only TRULY effective if you structure that variety in a way that allows these programs to build off of each other. The truth is that in most cases, it’s the opposite that occurs. For example, if you perform a muscle-building program that utilizes very low reps, you’ll increase strength in that rep range (and, assuming volume is high enough, you’ll gain mass). However, your strength endurance will drop—meaning, your ability to train effectively with high reps decreases. After that program, you jump onto a fat loss program, and most of those programs require you to train with high reps; however, your body is now deconditioned with regard to such training. In order to do the program, you have to lighten your weights considerably. So, yes, you’ll burn some fat, but you’ll also get weaker. After that, maybe you want more muscle…but now the problem is that you’re weak(er), so you have to focus on strength as well as muscle. Not the worst thing in the world, sure, but it slows your progress down substantially. You can see where I’m going with this. People seem to put a lot of thought (hopefully) into the program they choose—but all that consideration won’t mean much if you don’t put as much thought into the ORDER in which you perform those programs. And that brings us to the important part of this article. This is a term that refers to setting up your training into specific blocks of time (or periods), with each period focusing on a specific fitness quality. If you set up your programming in the right way, you’re consistently making progress, because each week you’ll be utilizing qualities developed the week prior to that. This, by the way, is exactly why my client Chris is getting such great results. Contrast this with the example I gave above, where you’re consistently trying to play “catch-up” just to regain what you lost during a previous program or period. Instead of a series of two-steps-forward-one-step-back cycles, you’re making consistent, forward and direct strides towards your goal. Periodization and progression are worked into everything I design, and that’s especially true with my new program, SUPER HERO Fat-Loss, which will “officially” be made available to you and a few other friends of mine tomorrow (Wednesday, July 18th) for a special 3 day VIP discount. You see, Super Here Fat Loss is a 12-week program that’s broken into 4 phases—each phase focuses on a different quality, as we discussed above. Phase 1 focuses on strength, phase 2 on strength endurance and fat loss, phase 3 on muscle gain, and phase 4 on density and overall fitness. To give you some insight into why that’s so effective within the context of the SUPER Fat Loss I want to walk you through how your body will react when you perform that program. During Phase One, you’ll get considerably stronger; however, because of the structure of the workouts, you’re also very like gain some muscle and lose some fat. During Phase Two, your focus is building muscle endurance and burning fat. And, because of Phase One , you’re now a lot stronger and more explosive; this allows you to use heavier weights during your fat-burning workouts, which in turn means you’ll be burning more fat and increasing strength endurance—even at higher weights. From there, you move on to Phase Three. This phase is dedicated to building muscle, which requires you to train with higher reps; however, you won’t need to lighten the load. Because of the strength increases in Phase One, and the endurance you built in Phase Two, you’ll now be able to lift heavier weight for MORE reps, which in turn allows you to build even more muscle. Phase Four requires you to call on each one of these qualities one day per week each—so during that phase, you’ll continue to increase strength, burn even more fat, and build more muscle, SPECIFICALLY because your body has become more efficient (and proficient) at each one. THAT’S the power of periodization and progressive programming—it creates a system wherein the whole is greater than the sum of its parts; the result is that each part of your training will benefit from everything else you’ve done prior. And, as I alluded to earlier, this concept can be applied either to a single program, like the SUPER HERO Fat Loss, OR it can be applied to strategically moving from one program to the next. Now you can probably see why understanding this concept is the KEY to bringing your training and your results to the next level. Remember, it won’t matter how good a program is if your body isn’t primed to get the most out of it—you simply won’t get the results you deserve. If you can avoid the mistake of running from program to program, and learn how to choose programs and schedule them in a way that builds off of each other, you will consistently make progress. One way, of course, is by picking up the SUPER HERO Fat Loss System which goes on sale for 30% off of the normal price on Wednesday, July 18th. 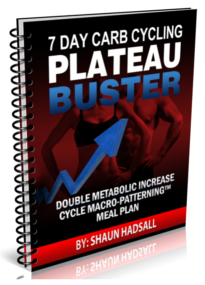 And for any of my readers that grab it through my link (in tomorrow’s email), I’ll be hooking you up with a 7 Day Plateau Busting Carb Cycling Meal Plan – 100% FREE. Just hit “like” to share this and keep your eyes out for tomorrow’s email. Plus, I have P90X, Insanity, Beachbody’s 10-Minute Trainer, and ProGrade’s new T30 program… and right now I’m getting ready to get Roman’s “Super Hero Fat Loss” and thinking about getting that new TapOut XT program. All of these programs are great in my opinion. And I guess I need to just pick one and stick with it, instead of “program hopping”, which as Roman indicates, is a big problem. I’m also thinking about how I might take all that I have learned from these programs and making my own custom program. I think for me I need a “keep it simple” approach. Even though I’ve been working out off and on for over 20 years, I’m really a beginner… so the simpler the better at this stage. Thanks for the steady stream of great information. As I make progress I’ll be sure to share my results. I like all your videos and the science behind all your explanations. I like to follow your program super hero fat loss but I don’t know if my e-mail is register in your web-site. Can you help me with this. Does anyone know if Leptiburn works? co-founder Joel Marion. I thought Leptin levels can only be fix with Exercise and macro paterning..